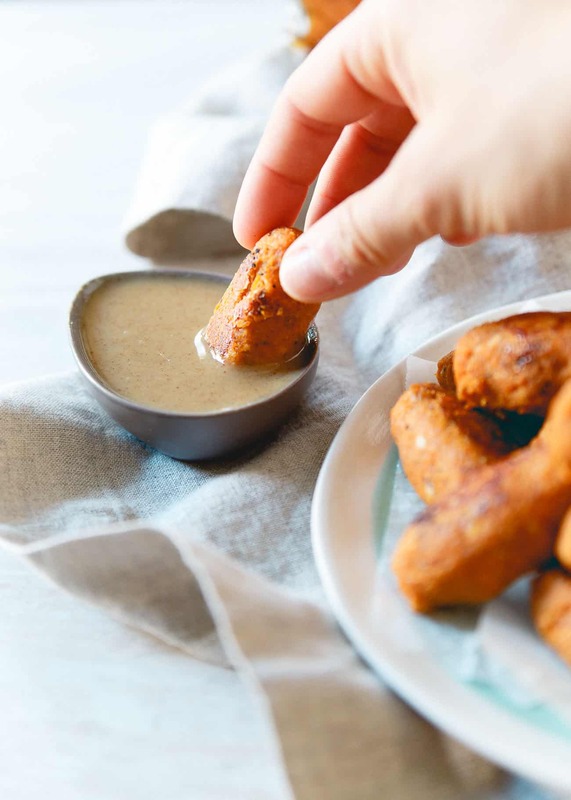 These baked sweet potato tots are infused with real maple syrup for a deep fall flavor and served with a dijon maple dipping sauce. Of all the food words out there that get people really crazy, I’d say that ‘tater tots’ is high up on the list. People freakin’ love those things. I feel like I missed out on this quintessential American food obsession because tater tots were never a thing in our house. If we got frozen pizza once a month, I considered that a h-u-g-e win. Tater tots weren’t even on my mom’s radar. This is the part where you can feel bad for me. Fast forward to the era of crazy Buzzfeed-worthy viral food concoctions and I feel like tater tots are in every other one of them (from totchos to tater tot burgers to mac ‘n cheese topped with tater tots). So in the spirit of the tot, these baked maple sweet potato tots are my healthier, heartier and dare I even say tastier, version of America’s favorite carb-y, grease laden potato invention. 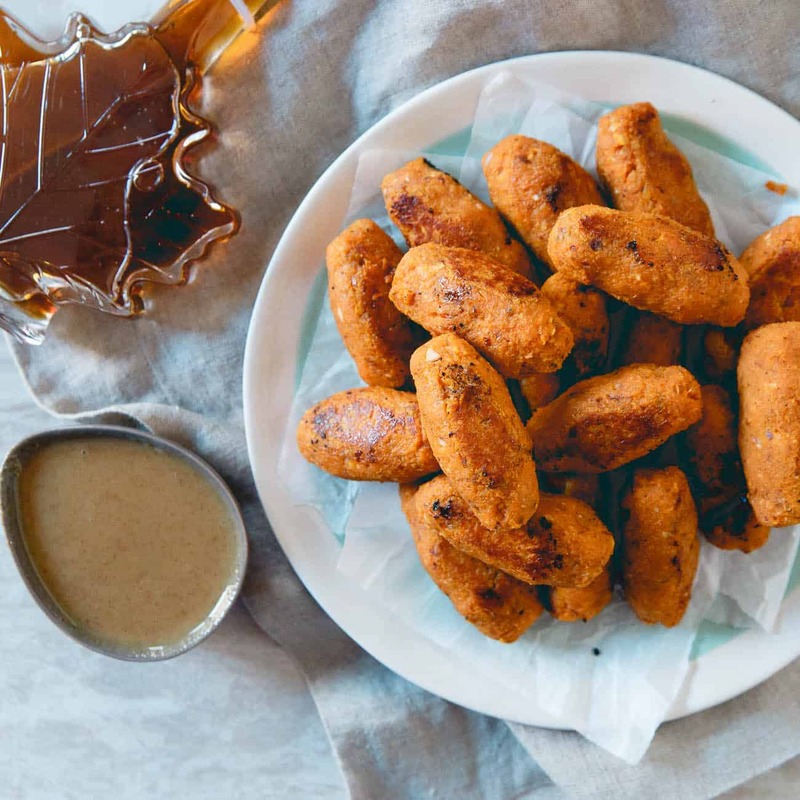 My favorite thing about these sweet potato tots is the Canadian pure maple syrup flavor both in them and in the dijon dipping sauce. It brings a lovely hint of sweetness to the savory potato flavor in the tots and honestly, tastes so deliciously sweet in the dipping sauce, it gives my all-time favorite Polynesian sauce from Chick-fil-A a run for its money. They may not be as cute (ok, and as crunchy as that fried-greasy coating of a real tater tot) but, if you’re looking for a fun, bite-sized tot you can feel good about eating, these are calling your name. I’ve been making up for lost tater-tot time with a batch every time I sit down to binge watch Gilmore Girls (yeah, I know, late to that game by like 10 years) so I can get to these new episodes! Toss sweet potatoes with the olive oil, maple syrup, salt and pepper on a baking sheet. Roast for 15 minutes in the oven. Remove from oven and transfer the sweet potatoes to a food processor. Add the onion, garlic, flours, breadcrumbs and spices to the food processor. Process until well combined and mixture starts to form a ball. Season with salt and pepper to taste. With wet hands, roll the mixture into tot shape and place on the same baking sheet. Broil the tots 2-3 minutes per side until browned. Make the dipping sauce by whisking the mustard and maple syrup together in a small bowl. Serve the tots hot, straight out of the oven with the dipping sauce. Best tots ever, these look amazing! YUMM! These sound awesome! I love sweet potato anything! Such a great twist on a classic! Wow! These sound awesome Gina! I love all the maple flavor goin’ on! I’m Canadian, so I am OBVIOUSLY alllll about that! 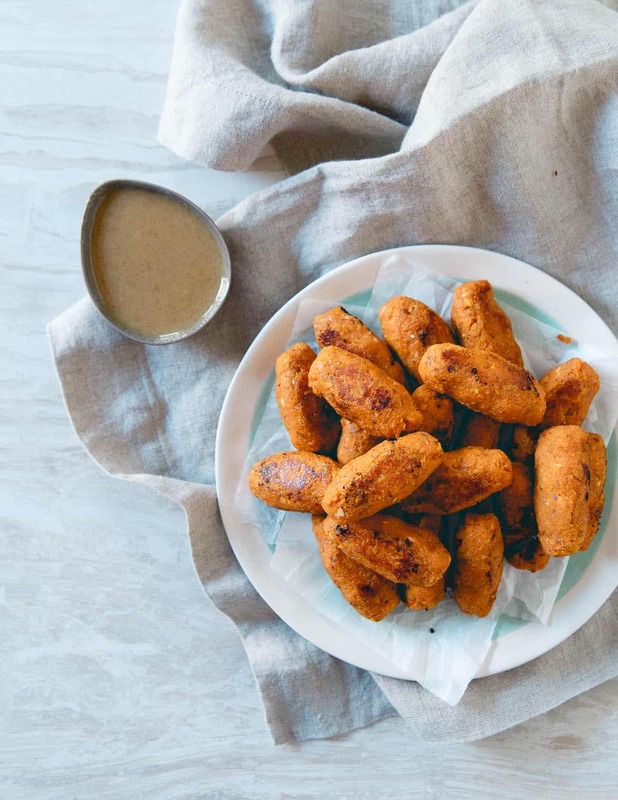 Sweet potato tots are pure genius and I want these in my mouth STAT. Well, being Canadian I love all things maple syrup. Loving the tots! tater tots were never really popular in my house hold either! This sweet potato maple tater tots give normal tots a run for their money! I didn’t know this was even possible! So much love. Tots plus rich gravy really amazing, looks delicious and love the spices on it. This is perfect recipe to try on. these would make the best little holiday snack! i don’t think there is anything better than a homemade tot!